Yesterday afternoon, I found myself at a loose end while Sweet Cheeks amused himself making mud pies in the garden, and I felt like getting a little messy myself. Out came the pre-colourerd panels I keep for when I realise I need a card for yesterday, and some of my ink sprays. I wanted to make the panel look a bit aged... not sure I'd be brave enough to try splattering an image I'd coloured myself! It was my plan to post this up this morning. But, about three minutes before we were due to leave the house to visit prospective nursery's and schools for Sweet Cheeks, (never on a day when there is absolutely NUFFIN planned.) I lost a filling whilst I was cleaning my teeth. Well, I say I lost a filling, technically, I didn't lose it, as I know exactly where it is. The point is, it's not in my tooth. Aside from the obvious, this is a problem for me, as I, like a lot of people, am Dentally Phobic. And this morning, I wasn't registered with a Dentist either. The filling in question has done really well because it was only a temporary one to start with. When I asked the Dentist how long it would last for, she told me two to three months. When I asked The Doc for his medical opinion, he muttered something along the lines of over cautious dental practitioners and told me I could easily double it. Ha! This baby did me for over a year and a half. Mwah, mwah Devon Dentist. Ah....love the way you made the image looked aged - and a wonderful card it is! So cute and pretty! Makes sense to me what you said about the dentist/fillings/etc....fifteen years would probably be too soon for me!! LOL! So soft, feminine and gorgeous Faye! Love the distressing and inking! Well what can I say Faye!- I have been avoiding mine for the past 6 months as they want to pull one out of the back and that's not up my street at all!! Fantastic card and love the inkiness in it. Colours are superb. Hope you all have a good weekend and manage the tooth repair!! Your Muver destresses me everyday ! Ensure you drink a bottle of White Lightning cider before using the D.I.Y dental filler kit, it acts like a fixing agent, well you feel fixed after it !! LOL. Oh my goodness Faye. You're a crack up!! I'm too a dentist phobic and know exactly how you're feeling. So glad you found a fix you can do yourself. I didn't know they existed. Oh yes, your card! I just love it and the splattering looks fantastic. Good luck with the tooth! Lol, I just LOVE the idea of DIY fillings!! Fab card, such a gorgeous image and I love your background. I just love this image, she is a darling. love how you coloured her and all. lol i know who to call now if i require dental work. Ooh! A very beautiful card Faye, love the image. Bet the filling kit was a lot cheaper too hun. Love your beautifully distressed card with your brilliant colouring. Sorry to hear about your tooth trouble. I was not even aware there was such a thing as a replacement filling kit. That's a very useful info. Love the card - I think its just brilliant. Hi Faye, another fabulous card - love the distressing. The image is so so sweet as well! Em goes up to Year 1 in Sept. We (well I!) spent ages deliberating and agonising over schools, now I wonder why I worried - she loves it!! PS - Am a tad disappointed in Boo, off chasing other lady cats when Miss Miss T is sooo close to motherhood. She is getting larger by the day, we beginning to wonder how many kittens there will be - Emily thinks 199! 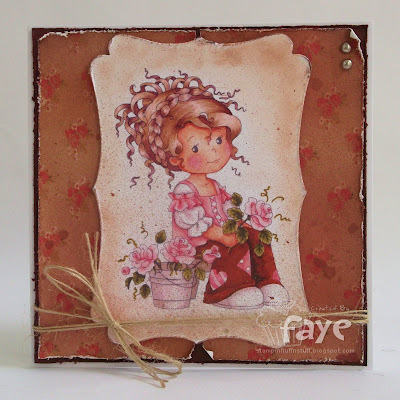 wow wow wow Faye...its absolutely amazing sweetie, i love the distressed look which makes it look vintage...just love it!! Awww....This is absolutly beautiful!! Love your distressing!!!! Well as you lost your filling and obviously in the house then I'm pretty 100% sure you can claim on your house insurance. So not only do you not need the dentist for 15yrs but the claim will pay for the said repair kit and I should think several baggage control parcels to slip through the net!!! A win win situation in my books. Erm where can I get this kit from then? Hugs Muver. Ahhh, the tooth story! I can sympathize with you, I only go if I have absolutely no other choice. I know that is bad, very bad, but it is true. I just scrub the heck out of them to make up for it! Love the image and the scruffy papers, very vintage looking.